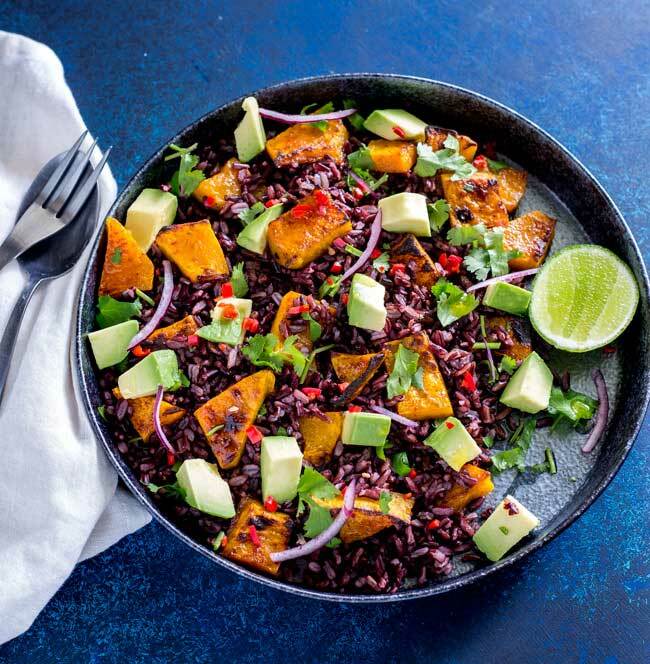 This Mexican Black Rice and Pumpkin Salad is packed with flavour. 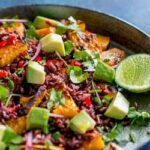 Honey and cumin roasted pumpkin, nutty sweet black rice, creamy avocado, spicy chilli, zingy lime and fabulous fresh coriander. So many delicious flavours that make this salad a taste explosion. 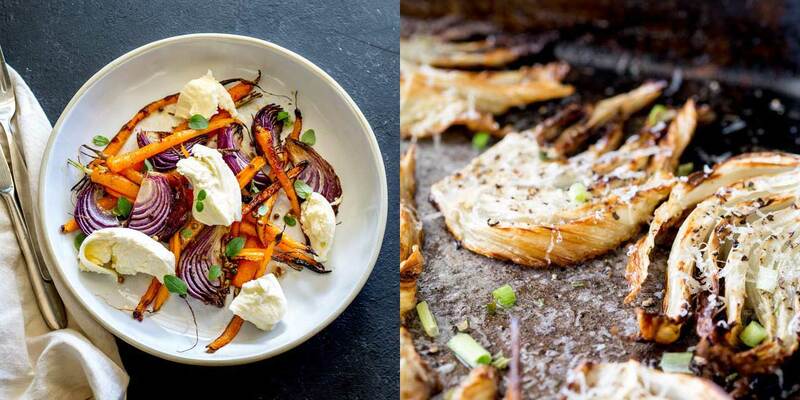 Just last month I shared my Roasted Spiced Carrot, Red Onion and Mozzarella Salad, and before that there was Roasted Fennel with Parmesan and Chives and so many more. Check out my roasted veg collection here. I have a few food obsessions 😉 Remember my charred lemon obsession? Man that was a good G&T!!! Or my dumpling obsession….haha I ate an awful lot of dumplings that month! And I still love them! I can’t help it, when you roast veg the natural sugars caramelise, and you get that smoky toffee flavour. A touch of olive oil, some salt and pepper and pretty much any veg you can think of tastes amazing roasted! Even the maligned Brussel Sprouts taste perfect when roasted! Today I have roasted pumpkin for you! Which is perfect for the start of fall up in the Northern hemisphere! Pumpkin season is fast approaching, which is good as I cannot get enough of it!!! I made this salad last week, demolished plenty and packaged the rest up for a friend. It travelled well, which makes it perfect for taking for lunch. Just be sure to give the chopped avocado a good coating of lime juice to make sure it doesn’t go brown and mushy! If you have access to a work kitchen, even better would be to chop your avo when you want to eat your salad. 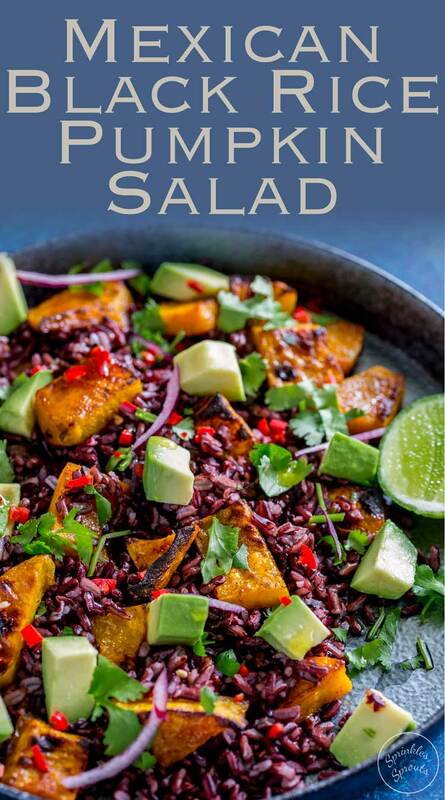 If you have never cooked black rice before it is pretty simple. It is best cooked by the absorption method. Low heat and double the quantity of water to rice. If you can’t find black rice, then wild rice would be a great substitute. Even white rice could be substituted in here. Although I would cook it in vegetable stock to add some extra flavour. 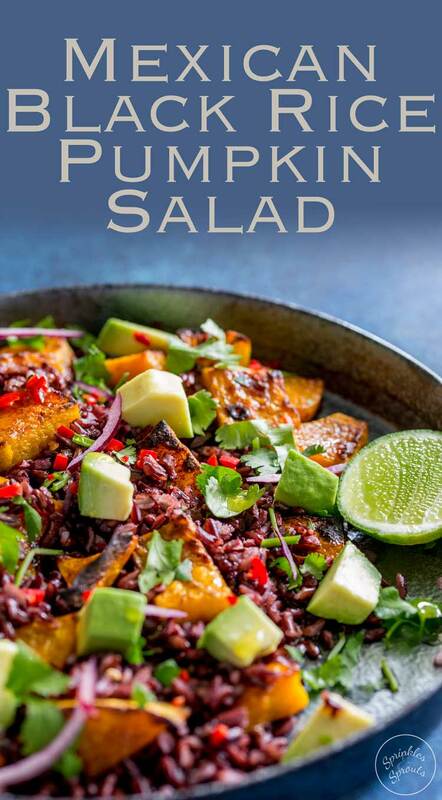 If you love this recipe for Mexican Black Rice and Pumpkin Salad why not pin it for later. Wash the black rice a couple of times. Bring 750ml (3 cups) of water to the boil, salt it and then add the black rice. Bring to a simmer, put and the lid and turn the heat to low. Cook the rice for 35 and then let it sit off the heat for a further 10 minutes. Whilst the rice is cooking prepare the pumpkin. Cut/peel the skin from the pumpkin and then cut the flesh into chunky 'cubes'. Lay the pumpkin over a lined baking sheet. Drizzle over the olive oil and honey and then sprinkle over the cumin, paprika and smoked paprika. Season generously with salt and pepper and roast for 25 minutes until soft and charred on the edges. Whilst the pumpkin is cooking prepare the garnishes. Peel and thinly slice the red onion. Cut the avocado into small chunks and squeeze over the juice of 1 lime. Finely chop the red chilli. Take a large bowl, add the rice and tip in the pumpkin along with any remaining oil on the baking sheet. Spread over the avocado cubes, onion slices and chopped chilli. Serve with a drizzle of EVOO, the lime wedges and a generous garnish of fresh coriander. Join the #SundaySupper conversation on twitter on Sunday! We tweet throughout the day and share recipes from all over the world. Our weekly chat starts at 7:00 pm ET. Follow the #SundaySupper hashtag and remember to include it in your tweets to join in the chat. To get more great Sunday Supper Recipes, visit our website or check out our Pinterest board. Would you like to join the Sunday Supper Movement? Its easy. You can sign up by clicking here: Sunday Supper Movement. This looks crazy delicious! It’s in this weeks menu. Thanks for the inspiration! What a beautiful and healthy salad! Everything looks so flavourful and I especially love the roasted pumpkin! Thanks for sharing! Isn’t it just so bright and colourful. The pumpkin in this looks amazing. What a delicious and hearty salad this looks. This salad with all of the roasted vegetables looks wonderful! 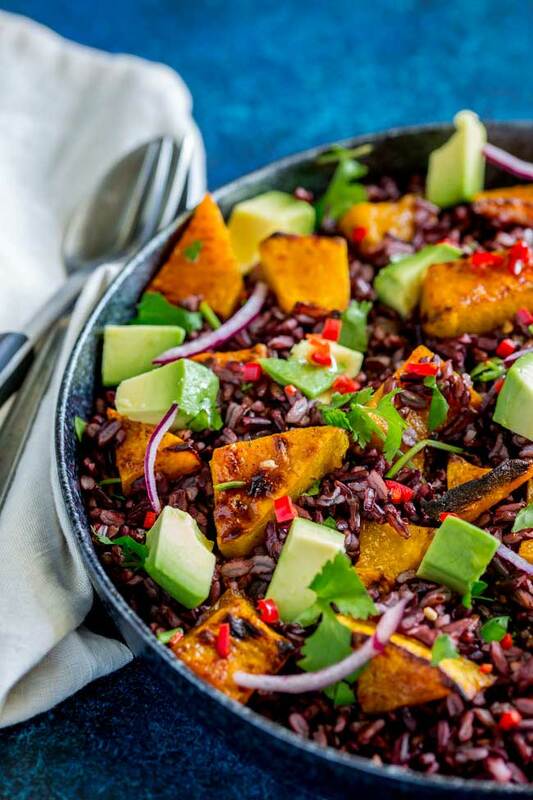 I am such a huge fan of pumpkin and this dish is so colorful! What a beautiful dish! 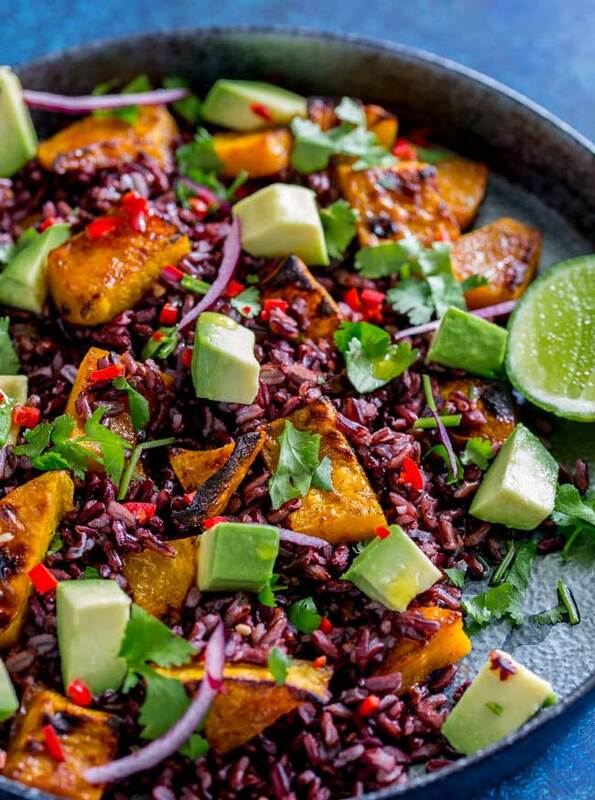 I love the combo of black rice and pumpkin. It sounds absolutely perfect! Will be making!